I spent three months developing this recipe for cinnamon and coffee soufflés due to a whole lot of factors. The first time I made them, the coffee taste was so overpowering that even I could not enjoy them, and I love coffee in anything. Dave only likes coffee in coffee so for him they were bad. The second time the coffee was gritty and no one likes to eat a dessert that resembles sand. Third time was a charm and then of course I made sure that the recipe was perfect by baking them again. The one thing I have learnt is that if you have left over soufflé mix you can churn it in an ice cream churner with great results. If you don’t want to do that, the cinnamon and coffee soufflés can be frozen with success. Soufflés are the one thing most home cooks find daunting, and it is also the one recipe that is actually easy to get right. It is all about following a few simple tips and the nicest thing about this recipe for cinnamon and coffee soufflés is that you can prepare them in advance and then just pop them into the oven as you are getting ready to serve dessert. Have you made soufflés before? You can prepare the pastry cream in advance – allow it to cool down and once cool cover with cling film and refrigerate until needed. You can prepare the soufflés in advance and place in the fridge until you need them. Add an extra minute for every 30 minutes they have been in the fridge after 1.5 hours. Serve with 250mls cream that has been whisked with the left over cinnamon sugar. this dessert looks fantastic! i bet it tastes great too! Worth the effort, evidently—these look fabulous! The tip about churning the leftover batter is a cool idea! 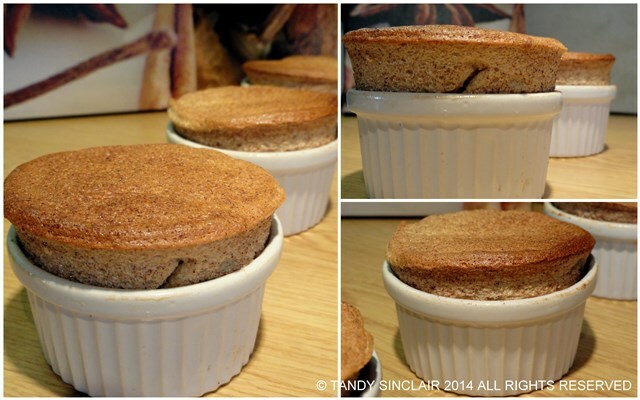 Love that coffee and cinnamon combo for this souffle. Very fancy and beautiful that you were able to get photos before they deflated and served them to your guests. Great little recipe! Wow 3 times certainly led to a great reward! This soufflé looks fluffy, and is cinnamon flavoured therefore magic 🙂 interesting combo with coffee! These look very nice Tandy, I’ve always been intimidated by the soufflé, no real reason I suppose. You make it seem quite easy. Maybe I should give it a go. Thanks for taking to time to really work on this. This looks terrific. I love coffee flavored desserts. When the juice fast is finished, this will be a special treat. It sounds like your persistence paid off. I’ve never made a soufflé and I’ve only had one in a restaurant a couple of times. Yours look beautiful. Your souffles turned out really nicely. I’ve only tried making souffles twice before and both times they didn’t turn out this pretty and puffy! Coming from you Roger, I take that to be the highest praise indeed. Thank you so much! Well done Tandy. Great recipe. They sound wonderful. I love cinnamon in coffee but haven’t tried the two together in a dessert yet. And I must still try a pinch of cinnamon in my coffee sometime! I make a lot of cheese souffles especially during Winter! I love the sound of this souffle for a dinner party though! 😀 Especially for those that love an espresso at the end of a meal!